The weather is changing here in Tokyo. Summer and its oppressive humidity suddenly gave way to windy days, the excitement of a “Super-Typhoon” and brisk nights when you suddenly realize that it is dark at 6pm. It is a pleasure for me because I love the Fall — I like wearing jackets and having lots of pockets and scarfs and the pleasure of wearing my hat without sweating. So it was, bedecked in a hoodie and windbreaker that my wife and I went to Sangenjaya to dine at Sancha Nomiba Marco for our 14th wedding anniversary. Sangenjaya is one of those neighborhoods that you wished you lived in. It has a European feel, streets filled with couples doing their shopping, a hint of prosperity in the air. A general sense of happiness in those that pedal by the abundant restaurants, vintage clothing stores and tiny markets selling curry fried chicken, pickles, freshly made fish cakes and, in one, a staggering selection of Italian pasta. 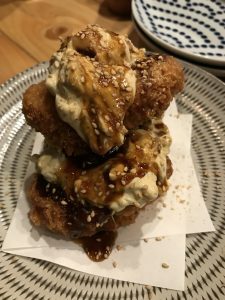 In New York terms, Sangenjaya is the West Village which places my beloved Heiwadai somewhere in the nether reaches of Queens. Fittingly, Marco is the type of neighborhood spot that you wished you lived by. It stays open later than many restaurants and a glow of warmth radiates from its window. If you peak inside there is a palpable sense of joy. With 6 bar stools, maybe 5 tables, Marco updates the classic Izakaya look with a youthful, cosmopolitan spirt. Without clutter, the room feels lived in with sake bottles and signed messages from happy customers decorating the walls. Chet Baker filling the air with his melancholy, strung out genius. We were seated at the bar, best seat in the house so far as I am concerned, looking into the immaculate, tiny open kitchen. A row of cold dishes — stewed daikon, a cabbage and pepper salad and some sort of chicken thing — were laid out. Next to that a gorgeous, tawny stew bubbled away in a giant pot. Like many Japanese restaurants, the chef stood up front preparing the cold dishes and plating while the hot dishes are finished in back. The staff here are young ( the chef told us that, at 29, he was the oldest of the 4 people working) and attractive, gracious and hospitable. 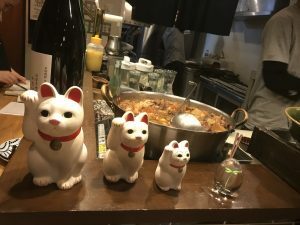 This personable group seemed to be having a great time working at Marco: they joked with each other and customers, explained dishes with pride and made thoughtful sake and shochu recommendations. Whereas this type of familiarity can get irritating in NY with missing orders, disappearing waitresses (maybe sharing some weed with the busboy in the alley) and vague contempt for customers, at Marco, everything is seamless. Service is paced brilliantly, the staff ever attentive for food and drink orders even as they all pitch in with serving, bussing, washing dishes, giving change, whatever. 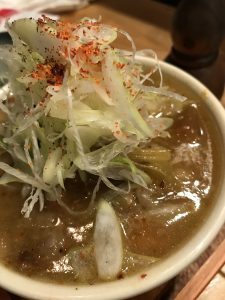 We started with the stewed daikon and bowls of that tantalizing stew. 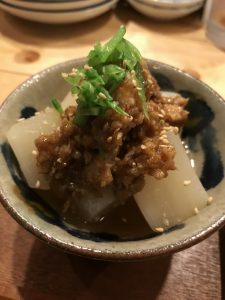 The daikon was finished with a topping of earthy miso and crumbled pork. 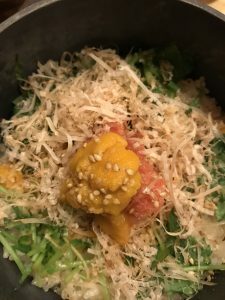 The stew was breathtaking — a long-simmering dish of beef offal, daikon, gobo root, scallion and carrot that hit the mouth and heart like rich, flavorful velvet with just a touch of barnyard funk on the back-end. Easily, one of the best organ dishes I have ever had. Then gorgeous sashimi featuring 6 different varieties of fish, fresh shiso flowers and radish. Right as we hit that sweet spot where anticipation meets calm, we were served huge fried oysters dressed with Bulldog and homemade tartar sauce chunky with hardboiled egg; a dish of rice — cooked to order with uni, codfish roe, green onion and bonito flake — arrived in stone pot that, when opened, suffused us with a steamy burst of heady oceanic aromas. Upon hearing that it was our anniversary we were gifted a bowl of perfectly tender clams in broth of seaweed and mirin. Each dish was so well composed, a treat for the eyes with gorgeous plates and stone-ware. We drank frosty beer, a nice dry sake from Kobe and a dangerous potato based shochu. Looking around at all the happy customers, drinking, eating and chatting I was struck by the fact that I could still hear my wife talking to me in a normal tone of voice. 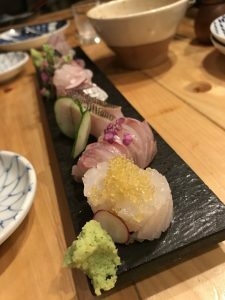 I’m not sure if it is Japanese people, different restaurant acoustics or what, but American restaurants are LOUD — by the end of a meal in a crowded NYC restaurant people are shouting to be heard. Not here in Japan. The bill came and was cheap – half of what an equivalent meal would cost in Brooklyn. If you come to Marco, make sure to make a reservation. As the restaurant is small and quite busy, you will be told how long you can stay and the staff will give you a last drink warning when time is running out. 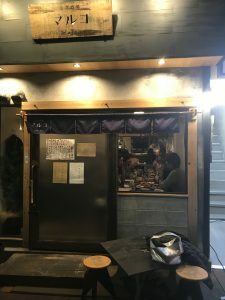 Though I could have sat there all night drinking sake, kibbitzing with the staff and eating my way through the menu, I was happy to give up my seat. I want Marco to have great turn-over, to prosper and continue serving up great food and cheer with such great value. Because, then, who knows, maybe I can entice them to open in Heiwadai? All relationships should be so lucky as to enjoy anniversaries so deeply suffused with such joy and contentment. And of course, love. Congratulations and love to you both. Oh everything sounded so delicious! Congratulations on the anniversary:) … and what is a Heiwadai?